The World Health Organization says the deadly Ebola outbreak in West Africa could infect more than 20,000 people before it is brought under control. The UN agency said the number of cases could be four times higher than that officially registered in some areas. It also called on airlines to resume "vital" flights across the region, saying travel bans were threatening efforts to beat the epidemic. 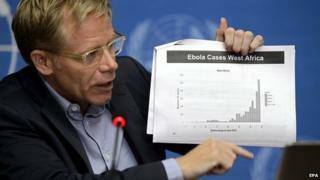 Announcing a WHO action plan to deal with the outbreak, Bruce Aylward said "the actual number of cases may be 2-4 fold higher than that currently reported" in some urban areas but he stressed this did not mean there were currently four times the 3,000 number of confirmed cases. The WHO assistant director-general said the possibility of 20,000 cases "is a scale that I think has not ever been anticipated in terms of an Ebola outbreak". "That's not saying we expect 20,000... but we have got to have a system in place that we can deal with robust numbers," he added. The WHO plan calls for $489 million (£295m) to be spent over the next nine months and requires 750 international workers and 12,000 national workers across West Africa. On Thursday, Nigeria confirmed its first Ebola death outside Lagos, with an infected doctor in the oil hub of Port Harcourt dying from the disease. Operations have not yet been affected in Africa's biggest oil producer, but a spokesman for Shell's Nigerian subsidiary said they were "monitoring the Ebola outbreak very closely". Officials at the Ecowas session backed the WHO's call for flight bans to be ended and called for states to reopen their borders to make it easier for health workers to access affected areas. Earlier Mr Aylward insisted bans on travel and trade would not stop the spread of Ebola, saying they were "more likely to compromise the ability to respond". Despite rumours to the contrary, the virus is not airborne and is spread by humans coming into contact with bodily fluids, such as sweat and blood, from those infected with virus. The BBC's West Africa correspondent Thomas Fessy says medical agencies are struggling to cope with an increasing number of cases and growing hostility from communities in certain affected areas. Efforts to prevent the virus spreading are unlikely to see any results given that most treatment centres are already operating at full capacity, our correspondent adds.